Several weeks ago I've been invited by Pullman Hotel Jakarta ( at Central Park ) to taste their All Day Buffet Restaurant called Collage. It was a quite enjoyable evening, I had fun meeting with the other bloggers and also meeting new people. I was pretty impressed with the interior design that Pullman Hotel has at the first time I stepped in. Yes it was my first time being here because the hotel is just recently open for business. Pullman hotel has a concept of Urban Pop meets Industrial theme that I think no other hotel here in Jakarta has that concept. Along with the hotel theme, Collage also has the same concept of the interior design. Sleek, minimalism, yet they're still has a quirky urban pop ambience. The restaurant are quite spacious. They also had outdoor dining area, that you can book for a private party. You just had to pay IDR 190.000++/pax for weekdays and IDR 228.000++/pax for weekends to dine here. Quite cheap compared to the other hotel's buffet right? Now let's talk to the interesting part, which is, FOOD. Just like the other hotel's buffet, they had many range of food. Italian, Indonesian, Western, Chinese, Japanese, Indian, you name it. But first, I want to introduce you to their signature dishes that you can order a la carte. 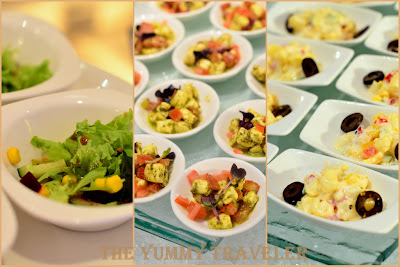 There's a 4 dishes that been the highlight of the day and OMG, I totally in loveeee with the presentation! It's just too pretty to eat ! First is Tomato Terrine. This is a Micro Cress Salad with Black olive puree, tomato and goat cheese. Next is Nasi Bakar Majapahit. This is a grilled steam rice with vegetables, braised beef in shrimp paste, wrapped in banana leaves. Then, Lamb a la Provencale. This is rack of lamb with Polenta, Comte Cheese and Thyme. Dessert, Praline Mousse. This is a Hazelnut and Almond ground, gelatine and Praline Paste. Pretty right? We also been served by their series of Cocktails and Mocktails. All of it taste nice, but I love one of their mocktails which is Balasis. It contains of lychee fruit, lime juice, mint syrup, peach syrup, guava juice and fruit candy. Sooo unique yet refreshing! To start, first I try the Antipasti Bar. There's sooo many range of it. I've try Tomato and Mozzarella ( taste nice with the herb taste in it ), Foie Grass Brulee ( too bad doesn't quite taste the foie grass :p ), and their signature Tomato Terrine ( Well I'm not a big fan of the goat cheese. So this one not my fave because the goat cheese quite overpowering the taste ). They're also had Fresh Oysters, Shrimp, Mussels and Smoked Salmon. To the Japanese station, I had Cold Soba, which taste quite ok, but has a lovely presentation. And their range of sushi, taste just okay. The Italian station which they served their homemade pasta ( gnocchi and tagliatelle ) with varieties of toppings that you can choose by yourself. That time I try the Squid Ink Tagliatelle cooked with tomato sauce, mushroom and dried chili. I know the photo doesn't look so appetizing, but it actually taste yum! The pasta was rather sooooo smooth and soft than the usual pasta, but I found it quite yum. And yes, one of the interesting food that day is a slow cooked Lamb. It is said that they're slow cooked the lamb for 72hours ! And yes, the loooong cooking time really pays off, the meat is soooo tender and juicy! I'm not a big fan of the sauce though, but really... you had to try these kind of lamb ! So Yum ! What I found here in Collage, they're also served kind of food that quite different than usual hotel buffet here in Jakarta. 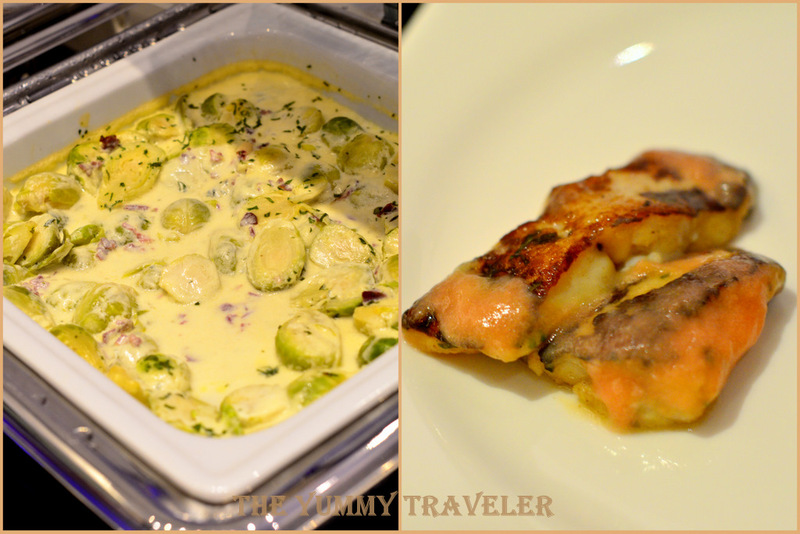 That day, I found Baked Dory Fish in Rhubarb Sauce ( which is yum ) and Brussels Sprouts cooked in Cream Sauce. Always save room for dessert, yes ? 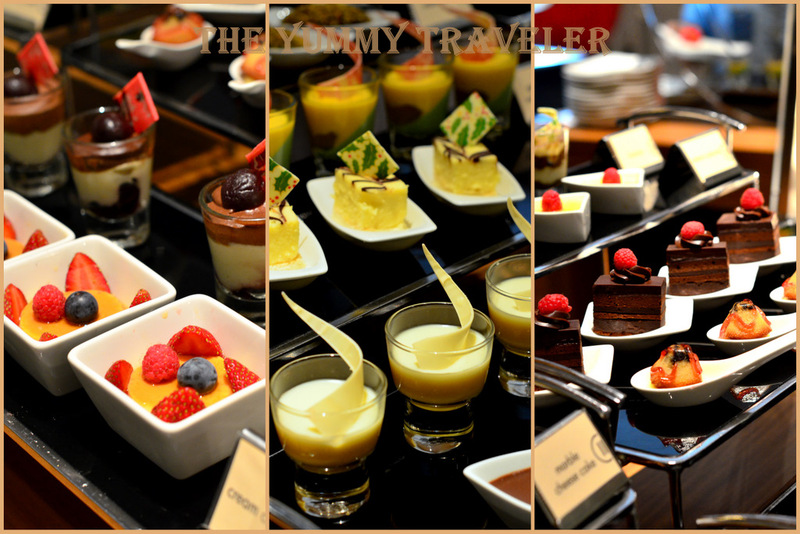 :p Collage also had many range of desserts that you can choose. I found a little heaven looking at those colorful macaroons and cakes :p But what I found the bomb is their Bread Pudding ! They served it still warm and I put White Chocolate toppings on it ( even better ! ) . The bread pudding itself taste smooth, moist and milky. So yum! Last words, Thanks to Pullman Jakarta for inviting. I totally came back another time! Also love your "look like recipe book" blog, pertinent. Appreciate if you could "LIKE" our FB Fan Page: www.facebook.com/pullmanjakartacp, as information of our soon to be opened Spa at Fit and Spa Lounge would be posted there as well as interesting games that would be played for people to have a chance to win some vouchers. Once again thank you and please stay in touch. @Mba Rita : Thanks a lot for the info! See you soon!